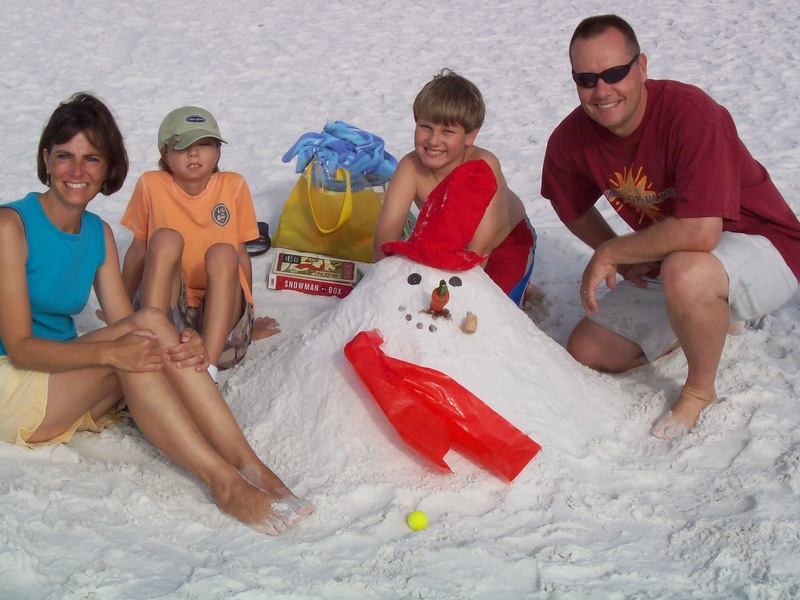 Here’s what’s up for the Christmas season 2014 along the Gulf Coast. Corpus Christi has a lot to offer this Christmas season so get out your calendar to make sure you have the important events penciled in. From “Storytime with Mrs. Santa Claus” at the Harbor Playhouse, The Town & Country Christmas Classic shopping gala, the 5K Santa Boogie, the Nutcracker Ballet, the Winter Wonderettes, to the Town Club Holiday Shop and more, you’ll have to schedule in your meal time and visits with friends. Enjoy all of the events and when it’s over, have fun as a participant or spectator at the Polar Bear Plunge on New Years Day. Click here for the schedule. Galveston‘s holiday season starts off with an event the day after Thanksgiving at the Hotel Galvez on Seawall Blvd. Carolers, the tree lighting, Santa and many great displays will be available to keep you and your family busy and in the spirit. Take in the Home for the Holidays Gift Mart and the Ice Sculptures and Festival of lights at Moody Gardens. Dickens on the Strand, Handbell Concert, Victorian Holiday Homes Tour, and a Victorian Pipe Organ Extravaganza are just a few of the other events planned for you. Click here for the schedule. Houston has a fun calendar of events. Start your planning with the H-E-B Parade in Downtown Houston on the 27th. Visit the Houston Zoo’s “Zoo Lights” and the largest display of lights along the Gulf Coast on Galveston Bay. The performing arts list includes The Rockettes, Dear Santa, Madeline’s Christmas, Very Merry Pops and more. There’s a candlelight tour of Houston’s oldest historic homes decorated for the holiday season. If you like concerts, be sure to catch the Preservation Hall Jazz Band, Elisabeth von Trapp, the Symphomy, and the ROCO Brass Quintet. Houston hosts 5K runs, holiday shops and an outdoor skating rink. Click here for more information. A New Orleans Christmas features the traditional Reveillon Dinner that all guests to the Crescent City should try. Here’s a list of restaurants that participate. Make your reservations early. While you’re in town, don’t miss caroling in Jackson Square, Celebration in the Oaks, Bonfires on the Levee, holiday shops, home tours and St Louis Cathedral concerts. Click here for Christmas holiday event information and laissez bon temps rouler through the holiday season. From Ocean Springs to Biloxi/Gulfport there are plenty of events to keep you busy. Pass Christian celebrates with a tree lighting, street concerts and crafts, Santa and a 5K run on Dec 5 & 6. Other tree lighting festivals include Pascagoula, Bay St Louis, Long Beach and Ocean Springs. Several towns have lighted boat parades including Biloxi/Gulfport. Holiday shops, performing arts and Christmas at Beauvoir should be on your calendar. For more information on Mississippi Gulf Coast Christmas click here. Mobile‘s Hank Aaron Stadium is hosting a drive-thru Christmas light show with synchronized music playing over your car’s radio. More holiday lights can be found at Bellingrath Gardens. The city cancelled it’s Christmas parade this year but you can swing over to the other side of the Bay for the Gulf Shores Lighted Boat Parade and other events. While you’re there, drive down Fairhope Avenue at night. The street is lined with heavily lighted trees and it’s really beautiful. 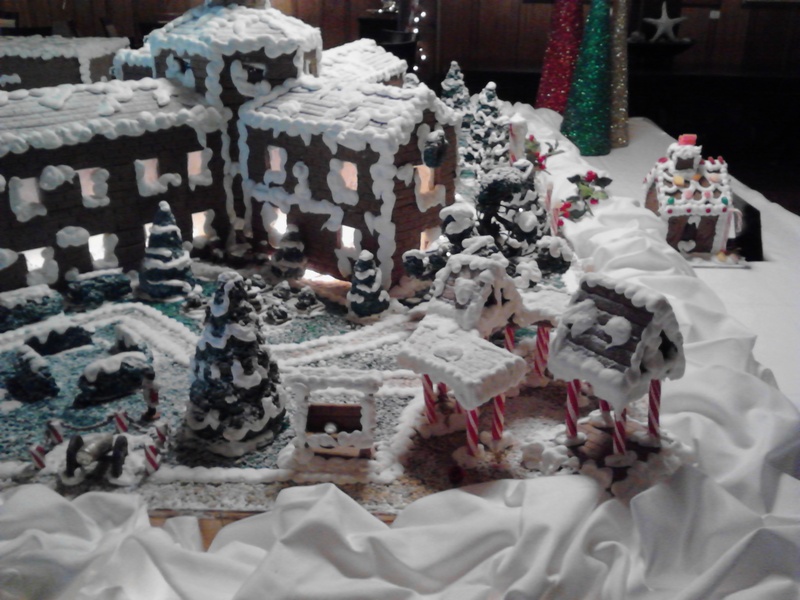 View the lights and the gingerbread display at the Point Clear Marriott Grand Hotel. Click here for the schedule. Pensacola holds its Winterfest right after Thanksgiving every year. Check on the schedule and get your tickets early because they tend to sell out fast for certain events. There is plenty to do: carolers, shopping, parades, reindeer games, carriage rides and more!! Click here. The Emerald Coast Christmas events include parades, Dicken’s Christmas, Jingle Bell Jog, Symphony, Holiday markets, lighted boat parades, concerts and, of course, Santa. Here’s the schedule of events. Tampa‘s Santa Fest has lots of family activities, a parade and ice skating. During the rest of the holiday season you can catch some holiday music concerts like the USF Choral Christmas Concert, the Nutcracker, Winterville, Twinkle in Tampa Bay (the decorated boat festival of lights) and more. Calendar of events for Tampa. 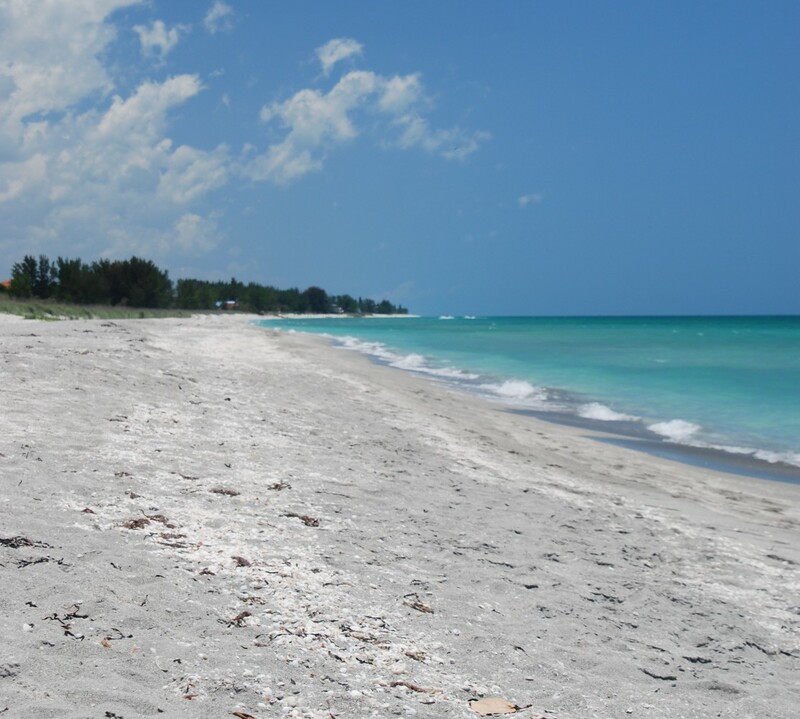 In Sarasota you can attend the Christmas parade and tree lighting, watch the lighted boat parade, listen to the Pops Orchestra, watch the Nutcracker, attend some holiday markets. Lakewood Ranch is hosting their Main Street party with parade featuring the jolly old elf, carriage rides and carolers. View holiday decorations and lights at Spanish Point and Ca’ d’Zan and Sarasota Jungle Gardens. Participate in activities and parades on St Armand’s Circle and downtown Sarasota. Click here for more information. I hope you got the picture: there’s a lot to do along the Gulf Coast during the Christmas season this year. Unfortunately I can’t name them all for you but try to make it to the events listed above or find some that are closer to your Gulf Coast home. What ever you do, I wish you a great season of joy and a Merry Christmas. Christmas trees come in all sizes and styles. So do decorations. From homemade to vintage glass ornaments, to simple colored balls hanging from the branches, everyone has their own theme of decoration. Mine is a beach theme and I want to share with you some tips to how to make this kind of themed Christmas tree work for you. We started out with white starfish, little white lights and gold balls. Wrapped gracefully with a gold 2-inch ribbon, the tree was very elegant in our home in Surfside Beach SC. This was a favorite for years…simple, elegant and easy to set up. The kids had their own little tree of “toy” decorations that they could play with, so this tree became the family tree year after year. Now we have a small tree in our small home and since the starfish are really too large for the tree, we have decorated it with other items. You can purchase clear glass or plastic ornament balls from craft stores or online. Simply draw out, first on paper, a great sea life design and remake it on the ball, in the round, using glass paints from the craft store. Attach a narrow, decorative ribbon around the top. My friend Susan made this. There are some plastic balls that come apart in the middle. You can put things into the ball and glue it closed. You’ll have a seam, but it’s the best ornament for larger items like larger seashells, beachcombing treasures etc. 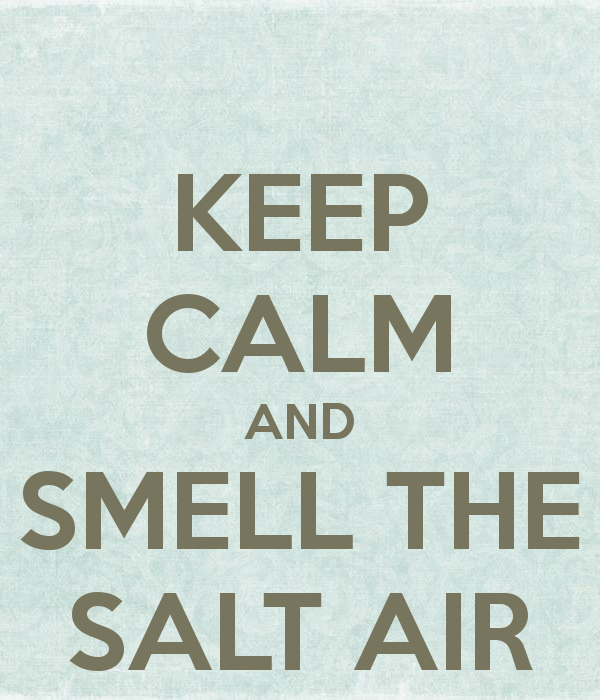 We keep clear, decorative bottles around the house with sand in them from our favorite beaches. 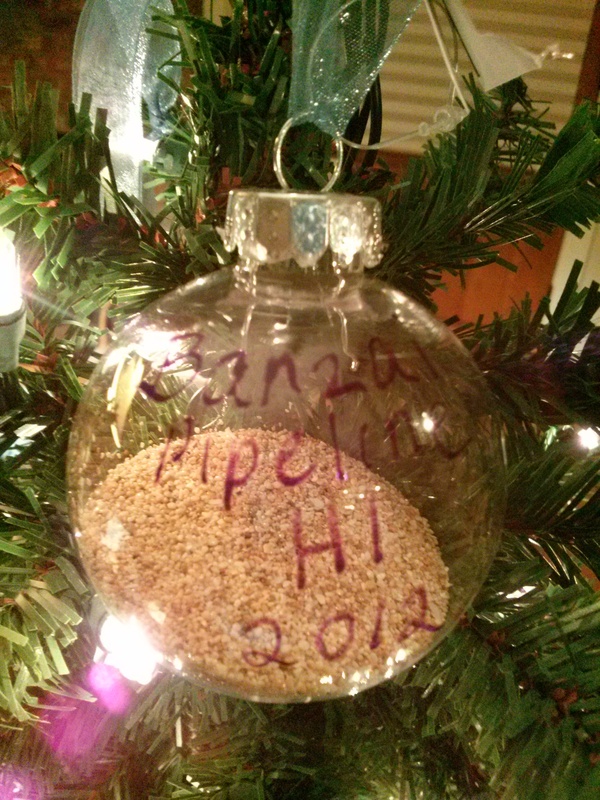 For a Christmas tree decoration, I have put some of the sand in glass or plastic ornament balls from craft stores. There are plenty of tutorials online about how to do this but I have read one yet warning not to overload the ornament. Sand can be heavy and too much inside the ball will be to heavy for the tree limb to hold it. Additionally, know your sand. Most is very grainy, some is very powdery. If you add small shells, they may sink into the sand, not to be seen. If you store the ball from one year to the next, a simple jostling may cause the powdery sand to coat the inside of the ball making it difficult to see what is inside. Experiment with each kind of sand you have and you may want to shake it to see what happens to the shells you add. Some of my ornaments need a re-do. Some I’ve filled with just sand. But all of them I’ve labeled somehow. You can take a glass paint pen and write the name of the beach on the ball or attach a decorative tag at the top alongside the hanger. If you are confident the ornament is what you want, run some glue along the top before capping it. Attach a ribbon to hang it with. Sand from one of our favorite beaches. The sand was heavy so I didn’t put much into it. I labeled it with a glass paint pen. There are a lot out there; some tacky, some classy. 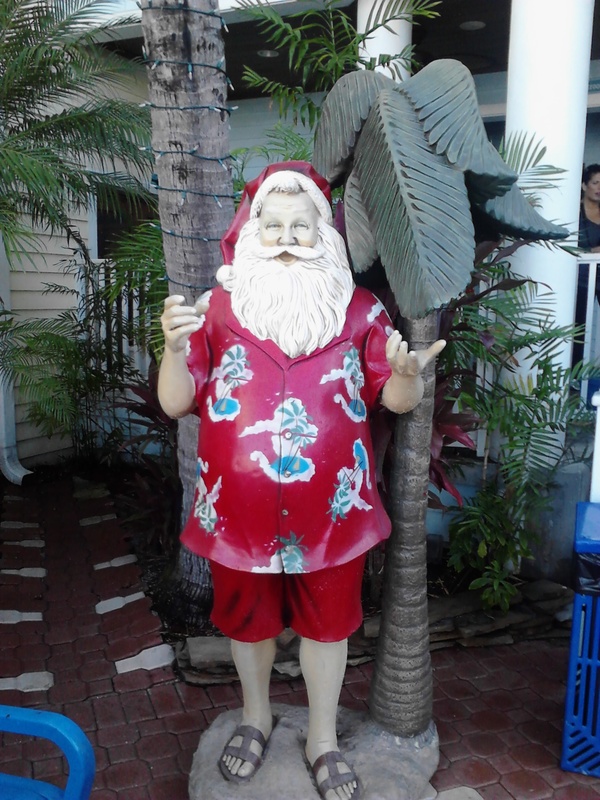 I was collecting Santas a few years back and combined this collection with the beach theme. 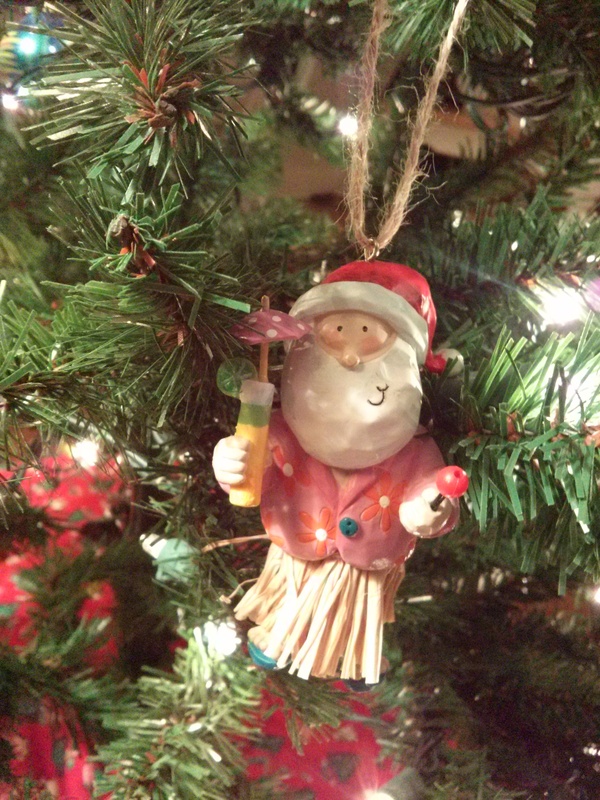 I’ve picked a hula Santa and a flamingo-riding Santa for my tree. 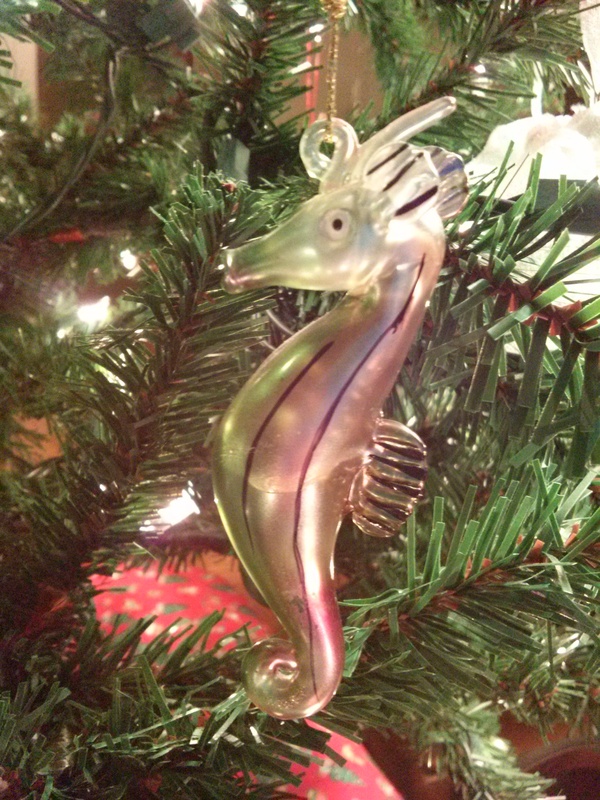 I have also found glass sea critter ornaments to add to my tree. Clams, Oysters and Sand dollars are common shells for painting on. Turn an oyster shell into a Santa head. 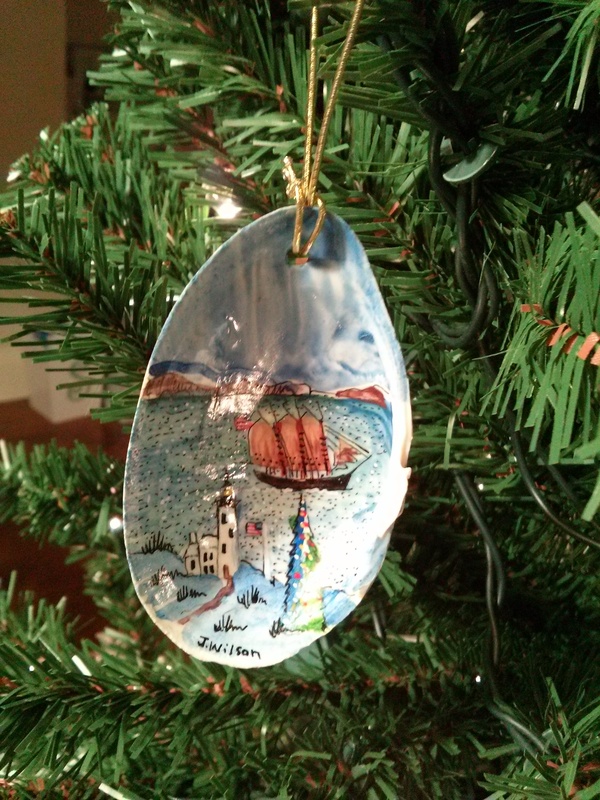 Paint a landscape, portrait or other design inside a clam or oyster shell. Decorate a sand dollar with a fun design or glitter. 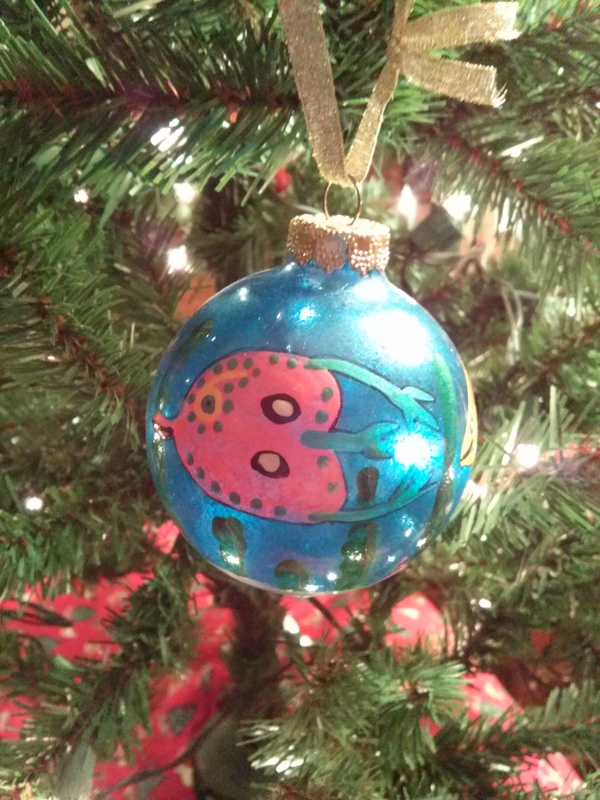 Sometimes a simple red or green ribbon and the date and place written with a paint pen or Sharpie pen on a shell or sand dollar is a perfect Christmas tree decoration. Don’t forget the small starfish. Attach a loop of ribbon with glue so you can hang it. 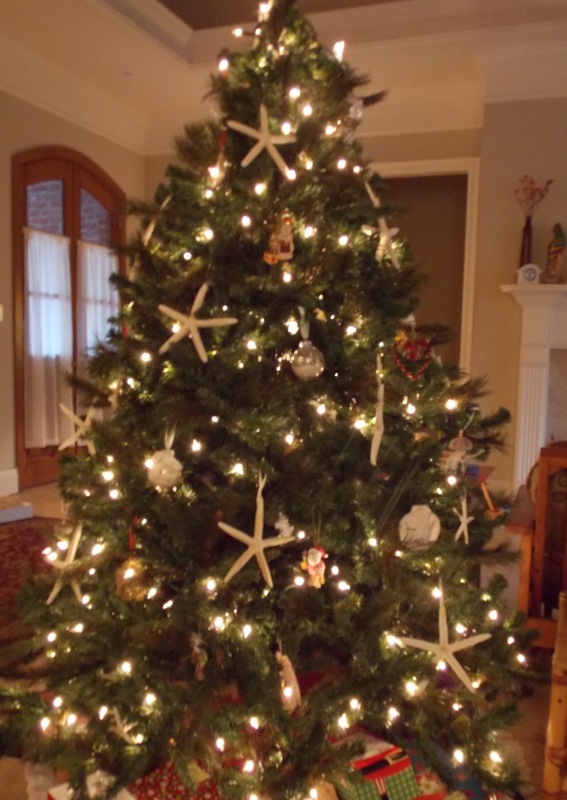 You can also use the starfish as a tree topper. Painting on a clam shell. A gift from my friend Catherine. 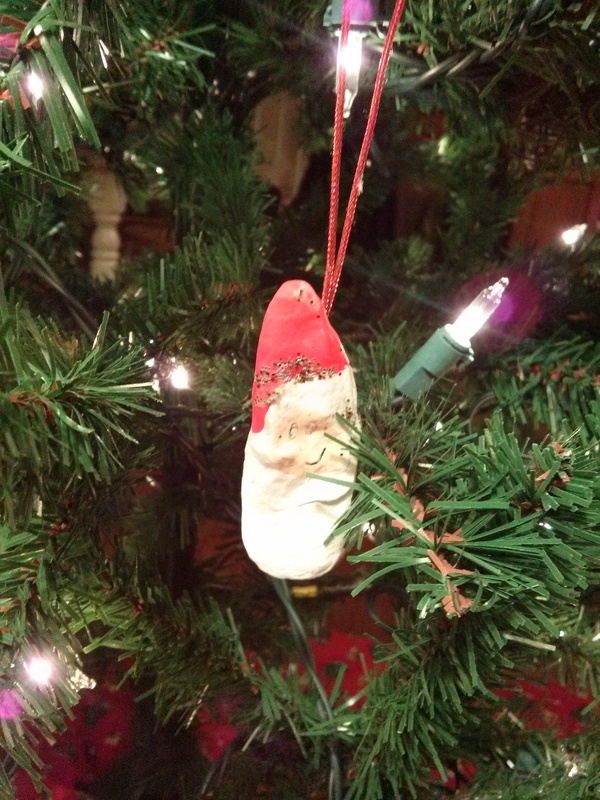 Turn an oyster shell into a Santa. My son, Austin, made this in first grade. One year, hundreds of urchins washed up on shore where I lived. They were dead: empty of life and mostly missing their spines. So I grabbed what I could carry, cleaned them and used some for decoration. Three different sized urchins stacked and glued together can become a snowman. Simply paint it white and add a face. Or, paint it green and add dots of colors to look like lights and decorations. 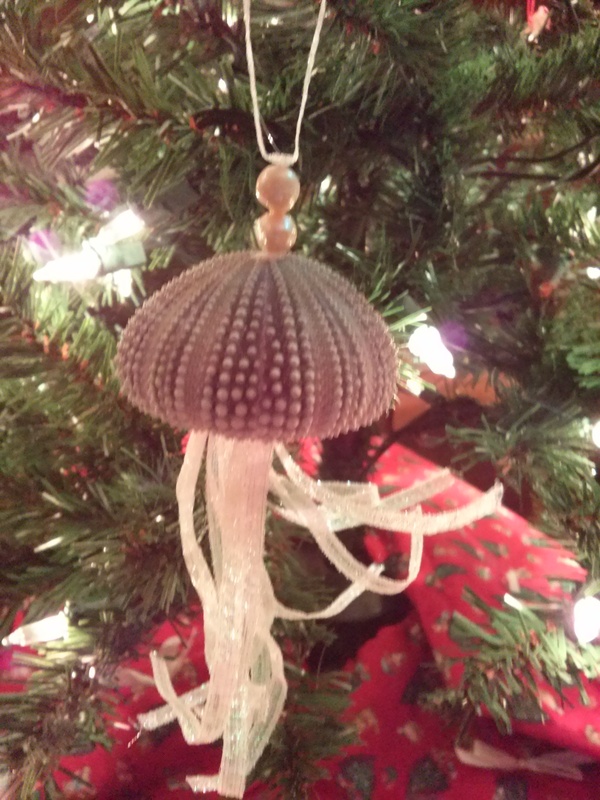 I’ve taken a single urchin test and turned it into a jelly fish ornament. Here’s how: Once cleaned out take a very thin ribbon and thread it into a bead larger than the hole in the top of the test. Cut 3 or 4 very thin ribbon pieces 6 inches long. Fold the ribbons onto the ribbon with the bead. Pull both ends of the beaded ribbon up through the bottom of the urchin and through the top. You now have tentacles hanging from the bottom. Thread a bead or two through the top ribbons to hold it in place above the urchin. This will also protect the hole from damaging and getting larger. Tie a knot at the end of the ribbons and hang on your tree. Whatever your theme, there are ways to take these ideas and adapt them. Happy crafting and Merry Christmas.